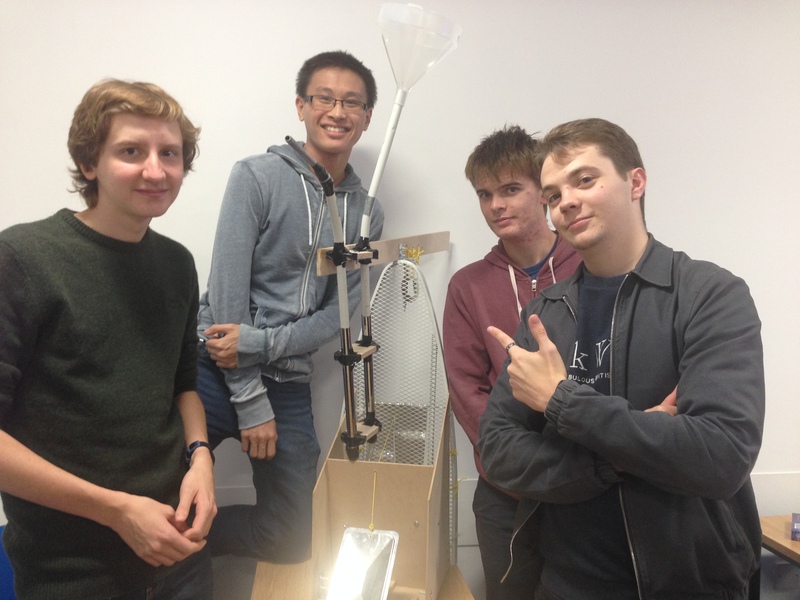 This autumn saw the Musical Instrument Scrapheap Challenge for first year students studying the acoustics MEng at the University of Southampton. The challenge: create a working musical instrument from items of scrap and a limited budget for essential materials. The criteria: design rationale, ingenious use of scrap parts, timbre, tuning, control of loudness, style and aesthetics, and presentation skills. The result: seven completely different music instruments ranging from good replicas of existing instruments to the ‘unique’! I had the pleasure of judging the competition, organised by Dr Keith Holland (Associate Professor at the University of Southampton), alongside Nick Pattie, Manager of Europe Powertrain NVH at Ford. The first demonstration was a well-thought-out instrument comprising strings, chimes and a drum. Although it demonstrated ingenious use of parts, the tuning and loudness were not competition-winning. The second was the ‘DrumBone’ (pictured), a peculiar yet resourceful invention making thorough use of an ironing board to create a trombone with a foot-pedalled kick drum and cymbals. This well-tuned instrument was demonstrated with a remarkably faithful rendition of the ‘Star Wars’ theme and had a good sound. The third instrument was the ‘Boxy Guitar’ that was tuneable (although the high string tension broke the head in a few places!) but very quiet. Following this was a glockenspiel device that had been impeccably tuned thanks to the perfect pitch possessed by one of the contestants, and had a beautiful timbre. It also had the addition of a damping device for the lowest pipe. The final instrument was a device made from a CD wrack: the bars were ‘pinged’ to provide the notes. There was an interesting selection of notes, although not necessarily in the right order! Nick dubbed the group ‘the Marketeers’ based on their convincing presentation skills. Following the award of prizes to the ‘DrumBone’ team I gave a presentation about the benefits of joining the IOA as a student member and Engineering Council registration through the IOA. Nick then provided an interesting and entertaining presentation about his career to date and the work at Ford, including sound design optimisation and the balance with Ford’s budget requirements. Whilst the examples provided were related to vehicle powertrain NVH design, the requirements to consider other design aspects of a project and the cost of solutions are, of course, relevant to any application. 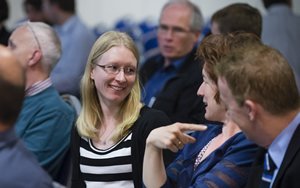 If you would like more information about becoming a student member or Engineering Council Registration, please do not hesitate to contact me (youngmembers@ioa.org.uk) or the IOA (Student membership: http://ioa.org.uk/membership/student-membership; Engineering Division: acousticsengineering@ioa.org.uk).